We’d love your help. Let us know what’s wrong with this preview of Tortured for His Faith by Haralan Popov. To ask other readers questions about Tortured for His Faith, please sign up. I was lucky enough to meet this man and his family when I was a child. I didn't realize the impact of his story on me. Powerful story of faith and perseverance. I really loved this book. Haralan Povov's faith is incredible. He amazes me. He loved the Lord so much that he was willing to go through years of torture for Him. I recommend that every single Christian read this. This is the amazing story of Haralan Popov, a Bulgarian pastor who spent 13 years in Communist prisons for refusing to bow to the Communist Party and its evil aims. Before the Communist takeover of Bulgaria - a land called "Little Russia," Popov pastored the largest protestant church in the nation and was his country's foremost evangelist. As a result, this high regard garnered him especially brutal and inhumane treatment throughout his long imprisonment. Yet, despite his daily torment he felt G This is the amazing story of Haralan Popov, a Bulgarian pastor who spent 13 years in Communist prisons for refusing to bow to the Communist Party and its evil aims. Before the Communist takeover of Bulgaria - a land called "Little Russia," Popov pastored the largest protestant church in the nation and was his country's foremost evangelist. As a result, this high regard garnered him especially brutal and inhumane treatment throughout his long imprisonment. Yet, despite his daily torment he felt God's presence as never before. While in the most vile, insufferable surroundings Haralan, "learned the lesson of love as never before. Though I had preached God's love from many pulpits, I came to see His love in a new way in the black of despair of subterranean cells and in the faces of countless fellow-prisoners. I found a greater reality in God than I had ever known before. The truth shines clearest where the cicumstances are darkest." Even after Haralan Popov is finally released from prison after 13 long years, he continued his work for the Lord. He became a leader in the Secret Church in Bugaria which grew into existance when the "official church" fell under Communist control. He eventually made his way to freedom (and his family he had long been separated from) and continues to minister to the Suffering Church by awakening free Christians to their need for Bibles. This book was incredibly hard to read for me, I couldn't finish it. But not because it's poorly written, nor because it was boring. It's so real and raw, that it's hard to handle... It changed me in a better way, although I wish the events in it would have never happened. Беше ми изключително трудно да прочета тази книга, не успях да я завърша. Не защото е зле написана или скучна. Но е толкова истинска и сурова, че не можах да я понеса... Тази книга ме промени в добра насока, но ми се иска събит This book was incredibly hard to read for me, I couldn't finish it. But not because it's poorly written, nor because it was boring. It's so real and raw, that it's hard to handle... It changed me in a better way, although I wish the events in it would have never happened. I appreciate having my heart pricked for the suffering church. I recommend this book to any Christian seeking to open their hearts up to those chained for Jesus' Sake. I have found that it will encourage you to pray for the persecuted and to give to those without bibles. Some people have really suffered in prison for their faith or being falsely accused for other things. This shows what being held and doing hard labor is like. I wanted to read it again ,this edition was not the same, I did enjoy it and am just as convinced 49 years later all my trials and tribulations were self inflicted and asking God why me is no longer in my Prayers or my vocabulary. This review has been hidden because it contains spoilers. To view it, click here. A christian classic. A pastor in Bulgaria during the Communist regime, Haralan Popov recounts the testing of his faith during 13 years of persecution in Communist prisons. In the early morning hours of July 23, 1948, he was arrested on false charges of espionage against the state. After being brainwashed and tortured for eight months in prison, Popov, and other ministers who had been arrested with him pleaded guilty under duress. Popov was sentenced to 15 years in prison. He spent the next 13 year A christian classic. In the early morning hours of July 23, 1948, he was arrested on false charges of espionage against the state. After being brainwashed and tortured for eight months in prison, Popov, and other ministers who had been arrested with him pleaded guilty under duress. Popov was sentenced to 15 years in prison. He spent the next 13 years and two months tortured in prisons and concentration camps. He was released on September 25, 1961 and joined his family in Sweden a year later. The Bulgarian government has since apologized for the wrongful sentence. After moving to the U.S. in 1970, Popov founded Evangelism to Communist Lands Inc., now known as Door of Hope International, to bring Bibles and relief to people in oppressive countries. In October 1988, during Glasnost, and for the first time in 26 years, Haralan Popov, now 81, was permitted by Bulgarian authorities to visit the church he pastored in Bulgaria. He died the next month in Glendale, California, of complications related to cancer. 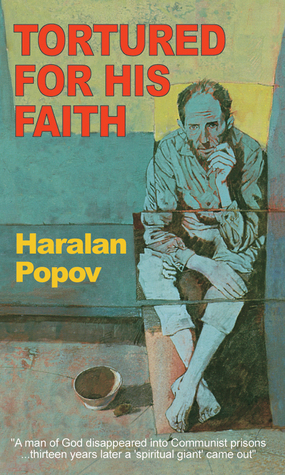 "Tortured For His Faith" was written by Haralan Popov in 1970 and recounts his ordeal at the hands of the Communists in Bulgaria after WWII. He starts by telling of his childhood and young adulthood as a staunch atheist, his coming to Christianity, his rise to be a church leader of the Protestant church there, and his midnight arrest by the Secret Police, mock trial, and subsequent 13 years and 2 months in various prisons around Bulgaria. It's purpose is, as he says, not to show man's depravity, "Tortured For His Faith" was written by Haralan Popov in 1970 and recounts his ordeal at the hands of the Communists in Bulgaria after WWII. He starts by telling of his childhood and young adulthood as a staunch atheist, his coming to Christianity, his rise to be a church leader of the Protestant church there, and his midnight arrest by the Secret Police, mock trial, and subsequent 13 years and 2 months in various prisons around Bulgaria. It's purpose is, as he says, not to show man's depravity, but to show the depths of God's love in the midst of man's depravity. However, the Communists there, as they have done everywhere they've gone, did a pretty good job of showcasing man's depravity. Sleep deprivation, interrogations 24/7 with a rotating shift of interrogators, the "death diet", hard labor, - these were his life for over 13 years. This book is the story of Haralan Popov, a Bulgarian pastor who was arrested and imprisoned for 13 years and two months for preaching the Gospel. The book deals primarily with Dr. Popov's imprisonment and the tortures he endured there. It is incredible to see the kind of inhuman and deplorable treatment he endured at the hands of the Communist men who tortured him for his faith and attempted to turn him into an informer. Through it all, Dr. Popov maintained his relationship with God and used his This book is the story of Haralan Popov, a Bulgarian pastor who was arrested and imprisoned for 13 years and two months for preaching the Gospel. The book deals primarily with Dr. Popov's imprisonment and the tortures he endured there. It is incredible to see the kind of inhuman and deplorable treatment he endured at the hands of the Communist men who tortured him for his faith and attempted to turn him into an informer. Through it all, Dr. Popov maintained his relationship with God and used his time in prison as a way to share the Gospel with everyone he could. When I was in 6th grade my teacher at the Christian school read this to us. It left a lasting memory. I found a copy this past year at Wheaton College and read it to my kids. It's hard to imagine life being tortured for faith, but it was hopefully eye opening for my kids. I skipped parts that were too gruesome. This is my favorite book from my childhood. I've read it again and again and have never failed to be amazed at its content. It's not a technically written book. It's simple but profound. Very well worth the short time it takes to read. It will increase your faith and your perception of your own life. I read this in 8th grade & had my eyes open to the persecution that many people suffer for their faith in Christ. I highly recommend it. We have no idea the freedoms that we have in many of our countries. Awesome book, encouraging to the saints. Everyone can benefit from reading what happens to Christians under Communism. Great read, similar to tortured for CHrist. First read this when I was 11 or 12. Reading to family in evening now. A true story of a man put in prison for his faith in Jesus Christ. The account of a Russian pastor who was persecuted under Soviet rule. This is an amazing story of a pastor's time in prison under communist Bulgaria. The events described are stunning. Amazing story, an emotionally difficult read for the sensitive or young, but so worth it. We read it as a family as a read aloud. Must have read the first edition ... I remember reading this as an 11 or 12-year-old (1974'ish). This impacted me deeply, opening my eyes to persecution of Christians. A brutal story of Christian persecution in Bulgaria. It is an eye opening view of what Christian life was like under the thumb of communism.